A homemade space station can give children an opportunity to make believe while learning about science. 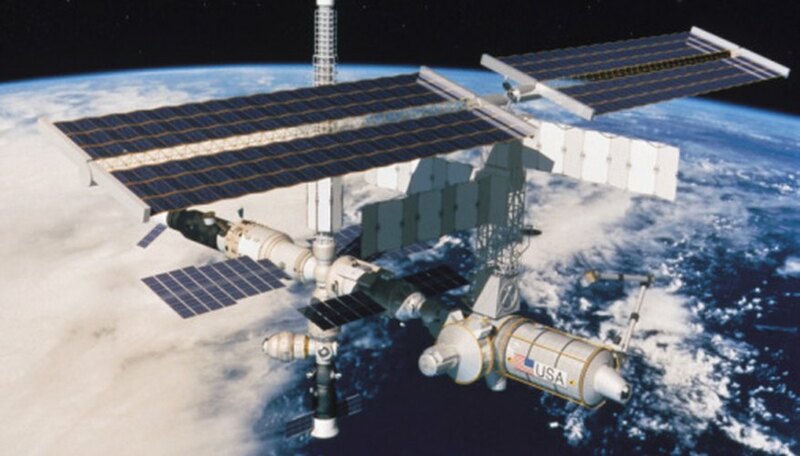 While working on this project, your child can learn about the real space station co-managed by Russia, the United States, Japan, Canada and member countries of the European Space Agency. Sketch a design of the space station on paper. Discuss it with the kids. Allow them to help with the design. Decide what materials to use and where to build the faux space station. These two decisions could go hand and hand. If you are planning to build outdoors, use wood. For indoor use, you can use sturdy boxes. Gather old boxes, aluminum foil and old aluminum cookie baking sheets (to serve as the solar panels). Align the boxes to match the design sketch. Wrap the baking sheets in aluminum foil, and attach them with rulers so they extend away from the main structure. Paint the boxes, allowing your child to pick colors and help with painting. Let the boxes dry outdoors. Cut circular windows on the sides of the space station. Cover the windows with clear plastic, if your children are old enough for this to be safe. For younger children, leave the windows uncovered. Attach sections of the space station with a play tube big enough for the children to crawl through. Play tubes can be purchased at large chain toy stores. Use construction paper to design the space station flag or insignia. Give the kids some crayons or markers, and let them design their own flag. Attach the flag to the end of an old antenna and place it on top of the space station. Set up an old monitor and keyboard to simulate a control room, so the children can pretend they are navigating and calculating data. If you have them or want to buy them, add a telescope, binoculars and a toy microscope for the laboratory. This will give the children the opportunity to learn while they play. Sam Williams has been a marketing specialist and ad writer since 1995. He has been published in magazines such as "Reaching Out" and "Spa Search." He served in various sales and marketing positions with major corporations such as American Express, Home Depot and Wells Fargo. Williams studied English at Morehouse College.